Indonesia, whose population lives on over 1,000 inhabited islands, has the 5th highest prevalence of stunting in the world. Stunting, caused by malnutrition, affects more than 9.5 million children in Indonesia. It results in diminished cognitive and physical development leading to a lifetime of poor health, reduced earning potential, and missed opportunities. The World Bank estimates that improved nutrition would only reduce stunting by 20 percent globally, so investments in water and sanitation are crucial to fully address this problem. 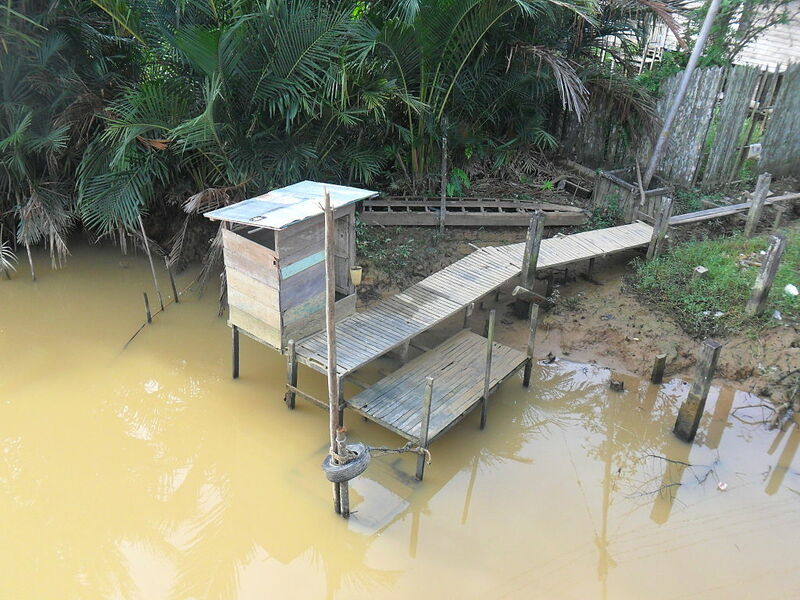 Latrines on the edge of the river in Kalimantan, Indonesia. Clean water is essential to reduce stunting and ensure adequate growth and nutrition. Diarrhea and other water-borne diseases are the second-leading cause of death in children under five—despite being both preventable and treatable. Chronic exposure to unsafe drinking water and frequent infections also lead to a condition known as environmental enteropathy in children, which impairs their ability to absorb food, vitamins, and minerals. Contaminated water paired with food insecurity and inadequate intake of micronutrients lead to chronic malnutrition and stunting. To reduce malnutrition and stunting in Indonesia, which cost its economy an estimated $5 billion per year in lost productivity, the Millennium Challenge Corporation, along with our implementing partner the Millennium Challenge Account of Indonesia (MCA-I), is working with the Indonesian Ministry of Health and Ministry of Villages to implement a five-year, $131.5 million, multi-faceted program across 11 Indonesian provinces. The Community Based Health and Nutrition Project to Reduce Stunting (CHNP) includes grant support for village level activities focused on health and education, a national media and behavior change campaign, micronutrient supplements for pregnant mothers and infants, and training for sub-district level and community-based health workers on nutrition, sanitation, and hygiene. Complementing the media campaign is a participatory outreach activity designed to raise community awareness of the benefits of sanitation. Using an approach known as Community Led Total Sanitation (CLTS), teams of health workers and village health volunteers perform “triggering” activities in their communities–facilitating discussions around open defecation, contamination of food and drinking water, and sanitation solutions. To meet the demand for sanitation services and products that the effort generates, local members of the private sector are trained as a corps of “sanitation entrepreneurs” to provide appropriate sanitation technologies like latrines, grey water disposal methods, and hand washing stations. By creating a demand for sanitation and clean water, as well as a private sector solution for providing them, we aim to catalyze systemic change that is long-lasting and sustainable. MCC, MCA-I, and the Government of Indonesia are working together to increase access to safe drinking water, reduce stunting, and improve the health, well-being, and livelihoods of future generations of Indonesians. Amit Chandra is an emergency physician and 2015-2016 AAAS Science and Technology Policy Fellow serving as a health systems strengthening advisor for the Millennium Challenge Corporation.